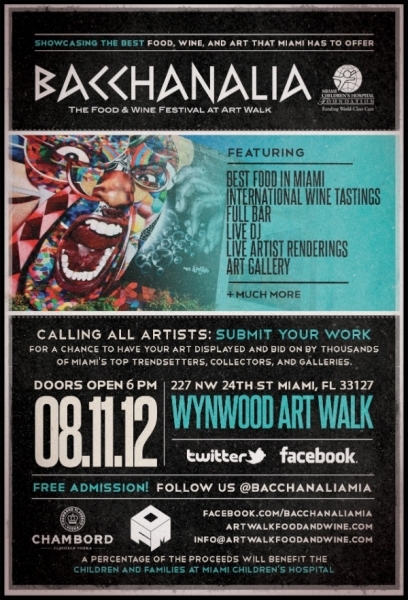 On August 11th, the first installment of Bacchanalia food and wine festival will take place in a 31,000 sq ft space in the heart of Wynwood. Bacchanalia pronounced (bak-uh-ney-lee-uh, -neyl yuh) is named after the wild and mystic festivals of the Greco-Roman god Bacchus, the wine god. The festival will be working with Miami International University of Art & Design and New World School of the Arts as well as Wynwood local galleries to provide guests with an extensive art collection. If you are interested in having your artwork showcased contact them at info@artwalkfoodandwine.com. Music for the evening will be brought to you by DJ’s from OFM. A portion of all the procedes are going toward the Miami Children’s Hospital Foundation. The event is free and open to all ages.